Documents extracted from home of IS military leader in Iraq show organization leader al-Baghdadi has two deputies to help run Iraq and Syria territories respectively, as well as a 7-man cabinet and governors running the different regions. Documents seized in an Iraqi military raid of the home of an Islamic State leader reveal the governing structures of the new self-declared caliphate for the first time, according to new data by the Terrorism Research and Analysis Consortium (TRAC). The information, extracted from memory sticks taken from the home of ISIS military chief of staff in Iraq, Abu Abdul Rahman al-Bilawi, who was killed in the military raid, shows how the jihadist group has gone from being a strictly military force to an organization that can provide state bureaucratic services like gas, food and legislation to the 4 million people in its conquered territories. Unlike his predecessors who reportedly kept the leadership centralized, current Islamic State leader Abu Bakr al-Baghdadi has decided to compartmentalize and appoint a rigid hierarchy of deputies to help govern all aspects in the vast territory the group has seized, according to the Telegraph. 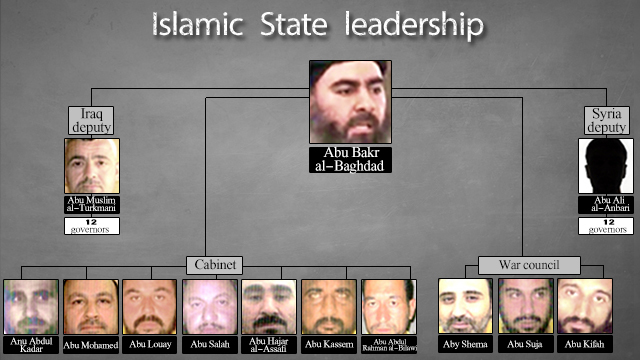 Islamic State's hierarchal structure. Click here to enlarge. "I describe Baghdadi as a shepherd, and his deputies are the dogs who herd the sheep (the Islamic State's members). The strength of the shepherd comes from his dogs," Hisham al-Hashimi, a security analyst who had access to the documents, told the Telegraph. The executive branch of al-Baghdadi's government, known as "Al Imara," is made up of al-Baghdadi himself, his cabinet advisers and two senior deputies. The deputies - Abu Ali al-Anbari and Abu Muslim al-Turkmani (whose real name is Fadel Ahmad Abdullah al-Hiyali) - oversee Syria and Iraq respectively. They previously served in the Iraqi military under Saddam Hussein. "These men (are) the reasons behind the strength of Abu Bakr al-Baghdadi. They are the key people who keep him in power," Hashimi told the Telegraph. TRAC's Southern Africa Director, Jasmine Opperman, told CNN she believed the current separation in the governing of Iraqi and Syrian territories was "purely administrative at this time." "They don't want to be seen as downplaying the caliphate, but to make it easier to govern they were forced to make a separation between Syria and Iraq," Opperman said. Each of these governments sends orders to governors of regions within each country, who instruct local councils on the implementation of the executive branch's decrees. The documents show each of the seven-member advisory cabinet has a role. Abu Salah, whose real name is Muafaq Mustafa Mohammed al-Karmoush, manages the finances for the Iraqi territories, according to the Telegraph. Meanwhile Abu Abdul Kadr, whose real name is Shawkat Hazem al-Farhat, advises on general management issues, and Abu Louay (or Abu Ali), whose real name is Abdul Wahid Khutnayer Ahmad, counsels on security. Other roles in the cabinet include managing prisoners (Abu Mohamed, whose real name is Bashar Ismail al-Hamdani), supervising internal communications (Abu Hajar al-Assafi, whose real name is Mohammed Hamid al-Duleimi) and managing foreign fighters' arrival (Abu Kassem, whose real name is Abdullah Ahmed al-Meshedani). The seventh member of the cabinet was al-Bilawi - the Iraqi commander from whose home the information was extracted and who is now dead. It is unclear who replaced him in his role as military adviser in Iraq. There are also 24 governors in charge of the different regions in the territory - 12 in Iraq and 12 in Syria - responsible for passing on and enforcing orders from al-Baghdadi's government. Each of these governors has his own "councilors" to help manage every detail in their respective regions. Hashimi told the Telegraph there were now 25,000 men in Iraq who work under the IS government. "Each of these men has a job within the organization, a geographical area in which they must work, and a monthly salary," he said. These salaries range from $300 to $2000 a month. Among these men are believed to be approximately 1,000 medium and top level field commanders, the Telegraph said. The caliphate's religious monitor is the Shura Council. It reports directly to al-Baghdadi and ensures the state's various local councils and governors are adhering to the caliphate's version of Islamic law. "Let's say a significant execution is going to take place, something that will get ISIS on the front page of the newspaper," Opperman told CNN. "It cannot be done without Shura council approval." Despite being appointed by and reporting to al-Baghdadi, the Shura Council keeps him and his executive branch in check as well, Opperman said. "The Shura council has the right to tell Baghdadi to go if he's not adhering to ISIS' religious standards. It would most probably never happen, but the fact that it's possible indicates the council's prominence," she said. Opperman said both the governing branch and the military branch of the Islamic State work in tandem. "It's two sides of the same coin. We've seen the military side, with the war cabinet that directs brigades. But now on the other side we're seeing how ISIS wants to govern. The two processes inform one another," she told CNN. See all talkbacks "Inside the hierarchy of the Islamic State"